If you're traveling down Madison Avenue you’ll find a treasure, tucked in between La La’s Custom Cakes and Holistic Lakewood, it's my new store, called Bear Soul Studio. It's a store that is truly a unique experience: A combination of a rock shop, art studio and spiritual healing arts. I wanted to create a unique place to share my gifts in the Lakewood area. I transplanted to Lakewood 9 years ago and fell in love with the charming beauty of the city. I've been in business for over 25 years, with 20 of those traveling with my gemstones, artworks and psychic sessions to cities all over the country. These travels have allowed me to study and learn from elders of the Native American traditions, European Nature Craft, the Wise Women and Afro Cuban religions. I was raised Christian, but found the answers to my questions after my near-death experiences only from learning with these elders. During this time my elders gave me permission to work with the Medicine of the Bear. This medicine is to help people heal themselves, to restore harmony and to live a good, whole life in balance. So, Bear Soul Studio was born, finding a landing spot/storefront at 15219 Madison Avenue in Lakewood. In my store you will find gemstones, jewelry, gifts, beads, and my artworks (paintings, sculptures and ancestor dolls). This is the largest collection of semi-precious gemstones in the Cleveland area, exotic, rare and some common, but all these treasures are unique. If you’re a rock collector or a person who uses stones to heal this is a great place to find an unusual gift or help yourself sleep better. I have the ability to pair people with the right stone even if they know nothing about stone healing properties. Like herbs for healing, such as green tea, St. John’s wart, and Echinacea, stones also come from the earth to heal. Amethyst is good for bad dreams, worrying and addictive tendencies. Clear Quartz has been used in the scientific field for decades because of its ability to regulate a precise frequency standard with accuracy. It can be used to help a person by that same idea: regulating the body or amplifying the frequency to bring clarity of mind. Shungite is a very powerful stone that is said to be a “miracle stone“ and/or “the stone of life.” Known for its incredible healing and protection properties, Shungite is fossilized carbon dating back to the formation of the planet. It’s suggested that it’s great to place in your water to eliminate toxins and placed around yourself to eliminate the effect of EMF’s (cell phones, computers, and other electronics). I teach classes on stones, meditation within Art techniques, healing modalities, psychic development, soul evolution and shamanism. I also have other services available in the store; Jason England with Rune readings & shaman energy healings, Danielle England with Tarot readings, Joy Marie Wedmedyk with Shaman classes & stone readings, and Lillith ThreeFeathers with Shaman classes & soul path reading. Classes coming up in the New Year will bring Shaman dreaming classes, Rune workshops, Message Circles, Spirit Art and Psychic Fairs. Come in to experience the wide array of possibilities to bring new energies into your life, home, and workplace this holiday season. Namaste’. Bear Soul Studio, 15219 Madison Ave. Lakewood, OH 440-319-2318. 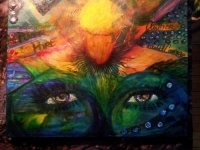 Lisa is a gifted Medium and Visionary artist since 1988, with special attention to women’s issues and shamanism. Lisa earned a BA degree with focus on Women Spirituality Studies and Cultural Diversity and carries teaching experiences from elders of Native American traditions, European Nature Craft, the Wise Women and Afro Cuban religions. In business since 1995, traveling the US, sharing the crystals, spirit art, and spiritual counsel with the masses of people searching for answers to the chaos in the world.